If you commit to this exercise, I guarantee you'll notice a shift in your posture. And if my theory is correct, you may notice improvements beyond just sitting up straighter. Want to improve your posture quickly, for free, with almost zero effort? I recently did it. So can you. I don't deserve any credit for this accomplishment. I didn't invent the technique, nor, as I mentioned, did implementing it ask much of me. I can, however, vouch for its effectiveness. I was introduced to this magic bullet by an acupuncturist, and I have an acupuncture theory on why it's so beneficial (see below), but getting acupuncture is not required. This solution to better posture is something you can do completely on your own, anywhere, anytime, without ever opening your wallet. You don't even have to get up from the couch. Turn up your palms. That's it. Whenever you're doing something that does not require use of your hands, turn them so that they're palm-side up (see the picture above). You also can do it while standing or walking, leaving your arms down at your sides and turning your palms so that they face outward in the direction you're facing. 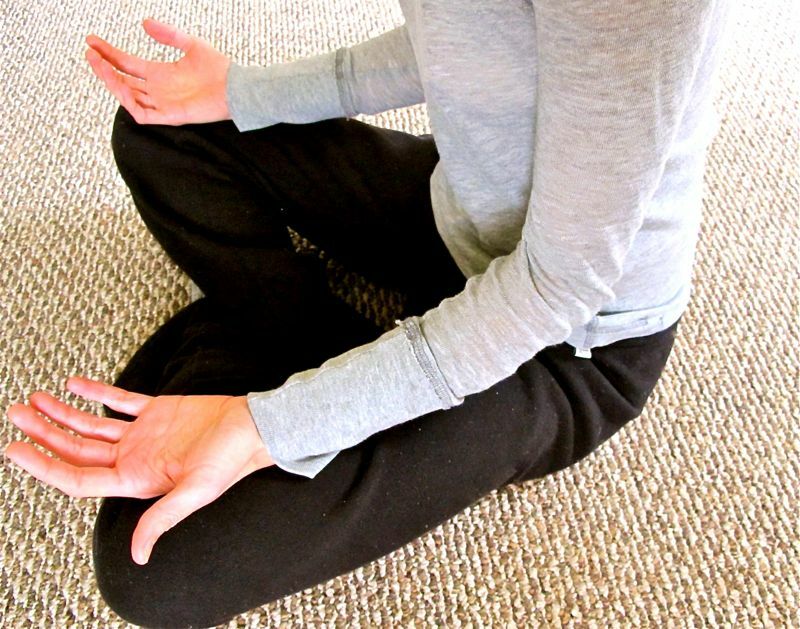 This palms-up position may be familiar to committed meditators and yogis who practice shavasana, but it's foreign to those of us who spend a lot of time at a computer, behind the wheel of a car, holding babies, making lattes, or doing pretty much anything else that requires constant hand use. Even when we're not using our hands, it's just habit to sit, walk or stand with our hands facing down or behind us. Because we're so unaccustomed to the palms-up position, when we assume it, the effects are felt immediately. There's a sense of momentum carrying the upper body backward opposed to the hunched forward motion we so naturally fall into. It feels as if someone is gently pulling back on your shoulders. Try it. If you're using your hands, stop and rest them against your thighs. Now turn both palms so that they're facing up toward the ceiling. It sounds simple, but I'm telling you, it works -- and fast. I learned this shortcut to better posture while attending a weekend seminar with Japanese acupuncturist Kiiko Matsumoto. Kiiko is known for her eccentric, entertaining teaching style. During lectures, she'll often diverge from a subject to impart what seems like an irrelevant anecdote. She's usually halfway through her next thought before you realize the remarkably useful nature of what she just said. At this particular seminar, Kiiko mentioned the palms-up technique quickly and in passing to illustrate a larger point about the rhomboids, the muscles that connect the scapula with the spine. She started using the technique herself after a friend pointed out that Kiiko was developing poor posture. After the weekend, I tried it myself. Anytime I didn't need my hands, I turned them palm-side up. If I could get away with using one hand -- when reading a book, for example, or walking my dog -- I'd turn the other palm up, alternating hands when the one in use got tired. In less than two weeks, I saw a marked improvement in my posture. I also noticed a general feeling of more openness in my chest. It felt easier to breathe. This second observation, about palms-up opening the chest area, relates to my acupuncture-related theory on why this technique is so important. In acupuncture, the meridians that run along the inside of the arm, from the chest/underarm to the palm, are Heart, Pericardium and Lung. Just as in Western medicine, where the the heart and lungs are considered such vital organs, the Heart, Pericardium and Lung meridians are critical in acupuncture. Heart: breathing, cardiac function, sleep, emotional balance and heat regulation. Pericardium: breathing, blood circulation and upper digestive function. Lung: breathing, immune function, perspiration, body temperature and urination. Not necessarily stuff you want to mess around with. Yet our lifestyles force our hands and arms into an almost constant downward/backward position, creating a tendency to slouch forward. This causes us to cave our upper bodies inward, crunching the Heart, Pericardium and Lung meridians. Allowing these meridians to flow more freely optimizes their ability to perform their respective functions. While your palms are turned up, try and visualize the meridians that run along the inner arm into the palm. The Heart meridian goes from the center of the underarm all the way down the arm, along the side that's closest to the torso, ending at the pinkie finger. The Lung meridian runs from the upper chest down the other side of the inner arm, ending at the thumb. The Pericardium meridian also begins at the chest and runs down the inner arm directly between the Heart and Lung Meridians, ending at the middle finger. Imagine these meridians stretching and regaining their normal flow as your palms gaze up.